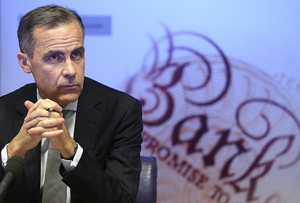 Markets now don't expect interest rates to rise until autumn 2015 even as unemployment falls. There’s a mixed ole bag of economic news today: unemployment falling and real wages finally rising, while the Bank of England slashes growth forecasts and warns inflation is going to keep on languishing below its 2% target for the next three years. To the Old Lady of Threadneedle Street first. The Bank still expects the economy to grow 3.5% this year, but slashed forecasts for 2015 from 3.1% to 2.9% and from 2.8% to 2.6% for 2016 in its November Inflation Report. Inflation will stay around 1% for the next year and ‘it is more likely than not that I will have to write an open letter to the Chancellor in the next six months on account of the inflation rate falling below 1%’, Bank of England governor Mark Carney said in a press conference. Markets had pencilled in an interest rate rise for the first half of the year, but now don’t expect a hike from the record 68-month low of 0.5% until October 2015. Good news for businesses that want to borrow cheaply and those with mortgages or looking to get one, but not great for savers. Once again, though, employment figures are defying the gloomier outlook elsewhere. Unemployment fell by 115,000 to 1.96 million between July and September, with the rate holding steady at 6%. Meanwhile, real wages have finally risen faster than inflation, at 1.3% compared to 1.2%. But that’s excluding bonuses - with them, earnings rose by just 1%. So even with a cheerier outlook in the labour market, it looks like Europe is going to keep dragging the UK economy down for some time yet - and interest rates and inflation with it.